Interact provide a range of individualised supports and employment services for people living with a disability. We provide services tailored to your specific needs and future goals, to help you live your life to the full. With over 25 years of experience in community services, we have built partnerships with government, service providers and businesses. Working together we promote social inclusion, health and wellbeing by empowering people to achieve their full potential. 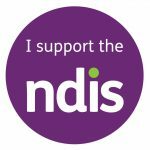 We champion and support people with disability in their choices, offering a range of person-centred services, matched to meet unique circumstances and individual needs.